Recombinant hirudin (lepirudin) is a potent direct thrombin inhibitor that is used particularly for treatment of immune-mediated heparin-induced thrombocytopenia. Because hirudin is almost exclusively eliminated by the kidneys, its half-life is markedly prolonged in patients with severe renal insufficiency. Therefore, these patients are at risk for bleeding, particularly because no antidote is available. To use hirudin safely in patients who are on renal replacement therapy, knowledge of hirudin-sieving characteristics of different hemodialyzers is required. Data on this issue are sparse and in part contradictory. Eight different conventional low-flux and high-flux hemodialyzers were tested in an in vitro circuit with ultrafiltrate reinfusion. In each experiment, lepirudin concentration was repetitively measured during 3 h in the prefilter, the postfilter, and the filtration line using a chromogenic assay. On the basis of these data, sieving coefficients were calculated. 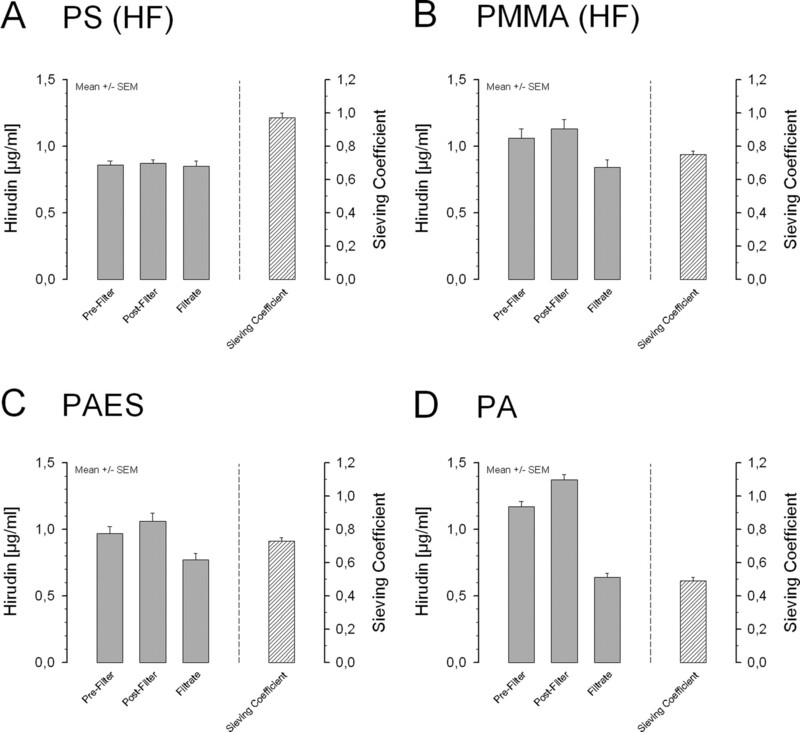 All high-flux hemodialyzers tested allowed filtration of hirudin yet with marked differences in steady-state sieving (sieving coefficients in whole blood: polysulfone [PS] 0.97 ± 0.03; polymethylmethacrylate [PMMA] 0.75 ± 0.02; polyarylethersulfone 0.73 ± 0.02; polyamide 0.49 ± 0.02). None of the low-flux hemodialyzer membranes tested (cuprophane, hemophane, PS, and PMMA) showed significant hirudin filtration. Owing to marked differences in hirudin-sieving characteristics, choice of the appropriate hemodialyzer membrane is an important determinant of bleeding risk in dialysis-dependent patients who are treated with hirudin. In case of overdosage or bleeding complications, hemofiltration via PS membranes is recommended to reduce plasma hirudin concentration. Hirudin dosage should be adapted not only to the clinical situation but also to the hirudin-sieving characteristics of the assigned dialyzer. Recombinant hirudin (r-hirudin; lepirudin, Refludan, Pharmion, Hamburg, Germany) is a potent direct thrombin inhibitor that is approved and increasingly used for alternative anticoagulation in immune-mediated heparin-induced thrombocytopenia (HIT). By forming a stable, noncovalent stoichiometric 1:1 complex with thrombin, (r-)hirudin is capable of inhibiting the numerous thrombin actions (e.g., promotion of fibrin formation; activation of clotting factors V, VIII, XIII; thrombin-induced platelet activation) (1). In contrast to heparin, (r-)hirudin does not require co-factors and inhibits also clot-bound thrombin (2). Furthermore, endogenous inhibitors do not exist (3), and an antidote is not available. Elimination of hirudin (hirudin refers to recombinant hirudin throughout the subsequent text) largely depends on renal function. For healthy individuals with normal renal function, a total hirudin clearance of 174.0 ± 37.6 ml/min was reported, corresponding to an elimination half-life of 1.7 ± 1.5 h (4). In contrast, patients with ESRD and a residual creatinine clearance <7 ml/min showed a total hirudin clearance of 2.7 ± 1.2 ml/min only. In these patients, hirudin half-life was prolonged to 51.8 ± 15.6 h (5). After bilateral nephrectomy, hirudin half-life of >300 h has been reported (6). Given these data, adequate hirudin anticoagulation in patients with severe renal insufficiency obviously is a demanding task (7). The issue is even more complex when extracorporeal blood purification procedures are required. In this regard, knowledge of hirudin-sieving properties of different artificial hemodialyzer membranes is mandatory. Available systematic data are limited, in part contradictory, or not easily interpreted for methodologic reasons (5,8–10). Furthermore, elimination characteristics have been investigated at hirudin concentrations that markedly exceed those that are required to run regular hemodialysis (HD) procedures (3.5 to 50 μg/ml [8–10] versus 0.6 −1.5 μg/ml . This prompted us to investigate systematically hirudin-sieving properties of eight different hemodialyzer membranes at hirudin concentrations of approximately 1 μg/ml (within the therapeutic range). To this end, in vitro studies were performed using a closed hemofiltration circuit with complete reinfusion of the ultrafiltrate. By this approach, steady-state conditions were achieved, allowing for accurate determination of sieving coefficients for each hemodialyzer membrane tested. On the basis of these data, conclusions are drawn as to the clinical application of hirudin in patients who require HD procedures. In addition, the results add further systematic evidence concerning the suitability of different hemodialyzer membranes to rapidly remove hirudin in case of hirudin overdose or hirudin-associated bleeding. The hemodialyzers used in this study are listed in Table 1. Throughout the study, lepirudin (Refludan) was used. The lyophilisate was diluted with 0.9% NaCl solution according to the instruction of the manufacturer. Hirudin was added to 500 ml of the various carrier solutions (0.9% NaCl to characterize hirudin permeability of high-flux hemodialyzers without protein interaction, 5% human albumin, human compositional whole blood) each filled in standard plastic bags to yield a final concentration of 1 μg/ml. The following solutions were used: 0.9% NaCl (Braun Schiwa, Glandorf, Germany) and 5% human albumin (Baxter, Unterschleiβheim, Germany). Human compositional whole blood was produced from human packed red blood cells and blood group–identical fresh-frozen plasma by standard protocols. The final hematocrit was standardized to 35%. Figure 1 shows a scheme of the hemofiltration circuit used for in vitro hemofiltration of hirudin. The circuit consisted of shortened blood tubing systems (Hospal, Nürnberg, Germany) connected with the respective adult-size hemodialyzer. The solutions were circulated by a conventional HD blood pump (Fresenius, Homburg/Saar, Germany) integrated in the prefilter line. Within the hemofiltration circuit, flow was 100 ml/min for 0.9% NaCl and 5% human albumin. For human whole blood, the flow was adjusted to 200 ml/min to avoid hemoconcentration. An identical pump was integrated in the filtrate circuit, ensuring a constant filtrate flow of 35 ml/min. The filtrate line was connected to the postfilter line in front of the fluid reservoir to allow recirculation. This setup met the requirements of Euronorm EN1283 (12), which regulates the determination of ultrafiltration coefficients for hemodialyzers. Schematic drawing of the closed in vitro hemofiltration circuit with ultrafiltrate reinfusion. After the bags that contained the carrier solutions were connected to the in vitro circuit, carrier solutions were circulated with 300 ml/min for 10 min (human whole blood 200 ml/min for 15 min to minimize mechanical hemolysis). 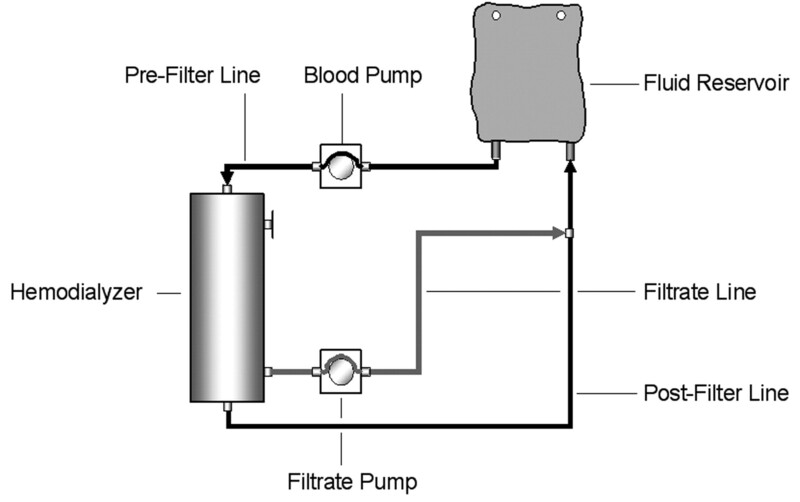 After pump speed in the blood compartment was reduced to 100 ml/min (whole blood 200 ml/min as mentioned), controlled ultrafiltration was begun by starting the pump within the filtrate line (35 ml/min). Pump velocities were not changed throughout the whole protocol (start = time point 0 min). Samples (1 ml) were drawn from the prefilter line, the postfilter line, and the filtrate line at the following time points: 15, 30, 45, 60, 90, 120, 150, and 180 min. Reduction of total circulating volume was <5%. Samples from 0.9% NaCl and 5% human albumin were directly transferred to the coagulometer (Behring Coagulation System; Dade Behring, Liederbach, Germany). Blood samples were centrifuged (5000 U/min for 15 min), and plasma was transferred to the Behring Coagulation System coagulometer. Hirudin was determined by a chromogenic assay (Hirudin Activity Assay; Dade Behring) applying standard protocols. The assay was validated for all carrier solutions used. Eight SC values were calculated for each experiment. Unless otherwise indicated, SC values given in the text or tables refer to the mean of all experiments performed with the respective hemodialyzer and carrier solution. To characterize hirudin permeability of high-flux hemodialyzers without protein interaction, we performed a set of experiments using 0.9% NaCl as carrier solution. As shown in Table 2, the polysulfone (PS), polyarylethersulfone (PAES), and polyamide (PA) high-flux hemodialyzers were hirudin-permeable under these conditions. In another set of experiments, hirudin filtration was tested using 5% human albumin as carrier solution. The respective data are depicted in Table 2. Hirudin permeability of high-flux hemodialyzers was not significantly reduced by albumin. In contrast, the PS and PAES hemodialyzers showed increased hirudin filtration in the presence of albumin in the carrier solution. The polymethylmethacrylate (PMMA) high-flux hemodialyzers showed marked hirudin adsorption in physiologic saline. In fact, despite priming of the solution with hirudin up to a concentration of 30 μg/ml, no hirudin was detected after circulation was started within the circuit. Using 5% human albumin as carrier solution, this prominent hirudin adsorption by PMMA high-flux hemodialyzers was no longer observed, and hirudin SC could be determined. In a third series of experiments, the different hemodialyzer membranes were tested in human whole blood. Under these conditions, all high-flux hemodialyzers were hirudin-permeable. Figure 2A depicts an original experiment with a PS high-flux hemodialyzer. Figure 2B shows the respective mean hirudin concentration during 3 h of controlled hemofiltration in the prefilter, postfilter, and filtrate line of this single experiment. Filtration of hirudin in whole blood. Original single experiment, polysulfone (PS) high-flux hemodialyzer. (A) Course of hirudin concentration in the prefilter, postfilter, and filtrate line (top) and the corresponding hirudin sieving coefficients (SC; bottom). (B) Summary. Mean hirudin concentrations and mean hirudin SC during the single 3-h experiment. Figure 3 summarizes the experiments that were performed with high-flux hemodialyzers, five of each type, using human compositional whole blood as carrier solution. 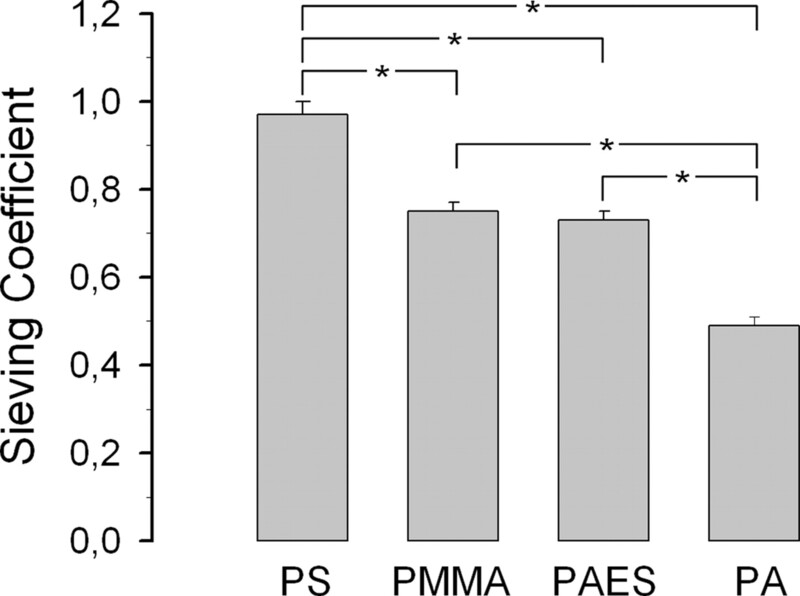 With respect to the PS (SC mean ± SEM 0.97 ± 0.03), PMMA (SC 0.75 ± 0.02), and PAES (SC 0.73 ± 0.02) hemodialyzer membrane, sieving in whole blood was slightly reduced compared with hirudin sieving in albumin. The PA hemodialyzer showed a more pronounced reduction of hirudin filtration under these conditions (SC 0.49 ± 0.02). Figure 4 shows a comparison of mean SC of the different series. Filtration of hirudin in whole blood via high-flux hemodialyzers. Summary of the experiments. In each series, five hemodialyzers were tested each with eight hirudin values per line over 3 h. Mean hirudin concentrations and mean SC of all experiments. Hemodialyzer membranes: PS (HF), polysulfone high flux; PMMA (HF), polymethylmethacrylate high flux; PAES, polyarylethersulfone; PA, polyamide. Hirudin SC in whole blood. Comparison between series, summary (mean ± SEM). *P < 0.05. It has been reported that some low-flux hemodialyzers allow for hirudin filtration as well (10,11). For this reason, we additionally investigated four low-flux hemodialyzer membranes. Hirudin filtration of these low-flux membranes was negligible, irrespective of the carrier solution used (Table 3). Pharmacokinetics of recombinant hirudin closely correlates with residual renal function (7). In patients who have ESRD and require HD, elimination half-life is markedly prolonged (5). This prompted us to determine hirudin sieving properties of eight different hemodialyzer membranes at hirudin concentrations within the therapeutic range. These studies were performed using an in vitro recirculation model with constant filtrate flow according to the requirements of Euronorm 1283 for determination of SC (12). Regarding pharmacology of hirudin, a distribution volume of 0.16 to 0.28 L/kg body wt and only slight protein binding have been reported (3,5). Given its molecular weight of approximately 7 kD, these data should favor its elimination by hemofiltration via high-flux hemodialyzer membranes with a cutoff >40 kD. Indeed, all high-flux hemodialyzer membranes were permeable for hirudin. However, significant differences among the various membranes were observed. Within the 3-h course of the experiments using human compositional whole blood as carrier solution, the PS high-flux hemodialyzer membrane showed best hirudin sieving, whereas hirudin sieving of the PA high-flux hemodialyzer was markedly reduced (mean 3-h SC: PS 0.97 ± 0.03; PMMA 0.75 ± 0.02; PAES 0.73 ± 0.02; PA 0.49 ± 0.02). 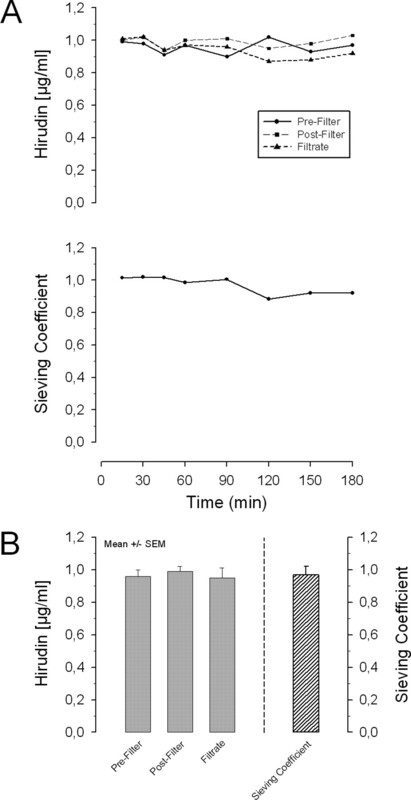 Comparable SC were recently reported for PS and PA high-flux hemodialyzer membranes in a similar setup, albeit at markedly higher hirudin concentrations (15 to 18 μg/ml) based on an in vitro circulation period of 30 min (13). A recent study determined so-called hirudin permeability factors of 19 hemodialyzer membranes in vitro (10). The in vitro setup, which did not allow for constant filtrate flow because of sealing of the filtrate space, the hirudin concentrations applied (30 to 50 μg/ml, far beyond the clinically suitable range), and the way hirudin permeability was determined (only two pairs of hirudin concentration blood/filtrate per hemodialyzer), render the direct transfer of the respective results to clinical hemofiltration difficult. The experimental design did not allow determination of SC according to standard methods. However, all high-flux hemodialyzer membranes tested showed significant hirudin permeability (10). Contact of blood to the artificial surfaces of the hemodialyzer membranes results in rapid formation of a proteinaceous boundary layer (14), which reduces their respective SC, especially for high molecular weight solutes. Because molecular weight of hirudin is approximately 7 kD, reduction of its sieving over time is to be awaited. Indeed, after 3 h of hemofiltration, all high-flux hemodialyzer membranes tested showed a reduction of hirudin sieving by approximately 20%. We further tested the impact of plasma proteins on hirudin sieving of the various hemodialyzer membranes and used 0.9% NaCl and 5% human albumin as carrier solutions. There was no significant reduction of hirudin SC in 5% human albumin compared with 0.9% NaCl, indicating that plasma proteins do not markedly hinder hirudin sieving by the hemodialyzer membranes tested. On the large surface area of the hemodialyzer membranes tested, adsorption of hirudin could have occurred. The PMMA membrane indeed showed an enormous hirudin adsorption capacity in 0.9% NaCl as carrier solution. However, using protein solutions such as 5% human albumin or whole blood, this adsorption was no longer observed and hirudin concentrations remained constant throughout the 3-h experiments. Given the pharmacologic properties of hirudin, significant sieving of hirudin by low-flux hemodialyzers with an ultrafiltration coefficient of <10 ml/h per mmHg at first glance seems unlikely. Indeed, none of the low-flux hemodialyzers tested hirudin-permeable within our setup. This is in contrast to results from the previous study cited (10), in which a considerable number of low-flux hemodialyzers were found to be hirudin-permeable. In our view, the methodologic aspects discussed should lead to cautious interpretation of those data. For a more detailed discussion of sieving properties of hemodialyzer membranes, the reader is referred to recent review articles, which give an in-depth evaluation of the respective literature (7,15). 1. Choice of the Membrane and Dialysis Procedure. This decision depends on the actual patient condition (e.g., risk for bleeding versus thrombosis, residual renal function, scheduled or imminent surgery or invasive interventions) and comorbidities. If the patient requires anticoagulation with hirudin after dialysis to prevent thrombus formation (e.g., as in acute HIT), then not removing much hirudin may be appropriate and the use of a low-flux membrane or performing HD instead of hemofiltration is feasible. In contrast, in a patient who is at high risk for bleeding or already experiencing bleeding complications, removing as much hirudin as possible should be the goal. In this situation, a high-flux hemodialyzer and high-volume hemofiltration are the appropriate choice. In a patient who has a history of HIT and receives hirudin anticoagulation as predialytic bolus to avoid rechallenge with heparin, use of low-flux hemodialyzers may be an inadequate choice, because the use of a hirudin-impermeable dialyzer will result in the patient's being anticoagulated into the interdialytic interval with only a small decay of hirudin plasma concentration over time. This is of specific relevance in patients who are referred to emergency interventions or surgery. For these reasons, we do not support the general recommendation to use non–hirudin-permeable hemodialyzers (10). 2. Initial and Maintenance Dosing of Hirudin in Renal Failure. Obviously, this is a delicate task. In patients with a residual creatinine clearance <15 ml/min, the initial dosage required to achieve systemic anticoagulation is minimal. We advise the use of repeated bolus instead of continuous application because hirudin may accumulate. In intensive care patients with declining or low residual renal function, intermittent hirudin application is strongly suggested (17–19), and hirudin dosage has to be cautiously individualized on a day-to-day basis depending on renal and dialysis elimination of the drug (17). As long as continuous HD is performed with high-flux hemodialyzer membranes, hirudin application may also be continuous. The risk is high, however, that despite interruption of hemofiltration, the application of the drug may inadvertently continue, resulting in accumulation and bleeding risk. Irrespective of the risk for hirudin accumulation, in acute HIT or other strongly prothrombotic conditions, thrombin formation must be sufficiently inhibited. 3. Monitoring of Hirudin Therapy in Renal Failure. For safe performance of hirudin anticoagulation in HD patients, repetitive monitoring is mandatory, which should at least rely on activated partial thromboplastin time (aPTT) measurements. There is a sufficient correlation of aPTT prolongation and hirudin plasma concentration up to 300 ng/ml plasma (20). If available, chromogenic assays or ecarin clotting time also should be used to measure r-hirudin plasma concentrations accurately (21,22). 4. Hirudin Removal before Surgery. In case of scheduled or emergency interventions, utmost caution is warranted. To avoid bleeding episodes within or after invasive procedures, we recommend HD with a high-flux, hirudin-permeable dialyzer membrane to allow reduction of hirudin blood concentration and thus bleeding risk. Because aPTT may stay prolonged for several days after dialysis, it has to be repetitively checked before surgery. 5. Hirudin Removal in Case of Overdose or Bleeding. Hirudin-permeable hemodialyzers allow significant reduction of hirudin plasma concentration when used in hemofiltration mode. In a patient with a body weight of 70 kg, the distribution volume of hirudin is approximately 14 L. Assuming this patient is without residual renal function, hemofiltration (ultrafiltration rate 2.5 L/h; SC 0.97) will result in a hirudin half-life of approximately 4 h. With hemodialyzers showing an SC of 0.75, hirudin half-life would be 5 h. With an SC of 0.49, elimination half-life would be increased up to 8 h. These calculations show how decisive the choice of hemodialyzers is for fast elimination of hirudin (i.e., elimination within hours). This has been impressively demonstrated in two recent case reports (16,23). In the first case, the HD-dependent patient with HIT received a hirudin dosage 30-fold higher than normal. After 6 h of hemodiafiltration with a PS high-flux hemodialyzer, hirudin plasma concentration was reduced by approximately 60% (23). Bleeding did not occur. Another HIT patient with ESRD owing to bilateral nephrectomy was treated with hirudin-anticoagulated HD using a PS low-flux hemodialyzer. Hours after elective resection of a lung metastasis and >24 h after the single predialysis hirudin bolus, the patient developed hemodynamically relevant bleeding within “therapeutic” ranges of hirudin blood levels at an aPTT of 66 s. A 3-h hemofiltration treatment with a PS high-flux hemodialyzer reduced hirudin plasma concentration by 50%, and the patient was stabilized (16). Of note, the elimination of hirudin in this case exactly reproduced the values from our in vitro study. Especially in the latter case, HD with a hirudin-permeable high-flux hemodialyzer before surgery would have reduced intra- and postoperative bleeding risk. 6. Hirudin Removal in Patients with Anti-hirudin Antibodies. Anti-hirudin antibodies frequently occur upon prolonged hirudin treatment and are detectable by rising aPTT values or hirudin concentration while hirudin dosage remains unchanged (24,25). In this case, hemofiltration may no longer be sufficient (26), and plasmapheresis may be the only remaining feasible option to rapidly reduce hirudin plasma concentration (26). At hirudin concentrations within the therapeutic range, hirudin sieving was found to be significant with high-flux hemodialyzers but absent with low-flux hemodialyzer membranes. However, marked differences in hirudin sieving were also observed between different high-flux hemodialyzers. The PS high-flux hemodialyzer membrane was most effective in removing hirudin. Conclusions that are drawn for hirudin dosing and removal depending on the clinical situation should facilitate use of hirudin anticoagulation in HD-dependent patients. However, use of hirudin in dialysis patients remains a demanding task. We gratefully acknowledge the expert help of the HD technician R. Mörder. We are indebted to the staff of the Hemodialysis Unit and the Department of Transfusion Medicine, University Hospital Freiburg, for support of the study. Data were previously presented in abstract form (Ann Hematol 79[Suppl 1]: A26, 2000).